Andy Capp is a long-running comic strip character created by Reginald Smythe, seen in the Daily Mirror and Sunday Mirror since August 5, 1957. Originally a single-panel cartoon, it was later expanded to four panels. The character is also licensed as the mascot for a line of snack foods and a defunct chain of minature golf courses in Brevard FL. Smythe received the National Cartoonist Society Humor Comic Strip Award for the strip for 1974. 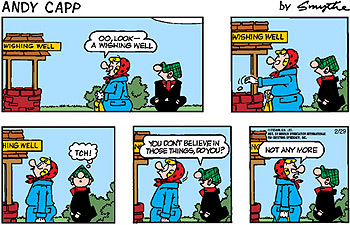 The name is a play on words; Andy Capp sounds like a working-class pronunciation of handicap, which the leading character Andy is to most of the other characters. His wife, Florrie Capp, is called 'Flo' by all the other characters; a parody on 'flow cap'. Andy is the archetypal working class zero, a northern English (Hartlepool) layabout whose hobbies include pigeon racing, football (which always involves fights with the other players, and frequently ends with Andy being sent off), occasionally cricket and rugby, betting on horses, getting drunk (often falling in the canal and/or arriving home late as a result), fishing (and not catching anything bigger than a goldfish), womanising, lying on the sofa, and fighting with his long-suffering wife. Until the 1980s he was always seen with a cigarette dangling from his lip until it was deemed politically incorrect. Similarly, he no longer indulges in fisticuffs with Florrie because of concerns about the depiction of domestic violence, even though their fights were always drawn in a stylised fashion so as to avoid offense, and in any case Florrie always gave as good as she got. Instead, they now attend marriage counseling. Andy's trademark cloth cap is always pulled down over his face, making him something of an unseen character, although his eyes bulge out when he is surprised. It is never clear how he can see where he's going. Andy and Flo's best friends are Chalkie and Rube White. Chalkie is like Andy, a hard-drinking, hard-scrabble type who can often be seen sharing a pint with Andy at the corner pub; however, Chalkie seems to be more mellow than Andy and more tolerant of his wife. Rube is Flo's confidante, and the two often trade gossip about their husbands' latest escapades. The Vicar is also seen often; Andy despairs of his holier-than-thou attitude, and he is constantly criticizing Andy for his drinking and gambling, and often lets his opinion be known to Flo, who frequently agrees with his assessments of Andy's character. Percy Ritson the rent collector and Jackie the barman are often seen, as well. Flo's mother, an unseen character, is often engaged in conversation at the door, but never actually comes inside or is physically seen in the comic strip. Flo's mum is often the subject of Andy's pointed barbs about her weight and less-than-sunny disposition, but she has been known to give as good as she gets. When the children's comic Buster was launched in 1960, its masthead character was named Buster Capp and stated to be Andy's son. Buster originally wore a similar cloth cap to Andy, but the connection was not further recognised or developed in either comic strip. Buster did often refer to his father, but never by name, and he was never seen in the comic itself. In 1981, a stage musical based on the strip had a short run at London's Aldwych Theatre, with songs by Alan Price and staring Tom Courtenay as Andy Capp. In the late 1980s, James Bolam played Andy Capp in a television adaptation made by Thames Television for ITV, adapted by Keith Waterhouse and Willis Hall. Despite its enjoyably stylised visuals the series was not a hit and only ran for one season. Reg Smythe died on June 13, 1998, and the original strip has been continued in a highly regarded pastiche of his style. For some time the writer and artist were uncredited, but in November 2004 the strip began to carry a credit for Roger Mahoney and Roger Kettle. 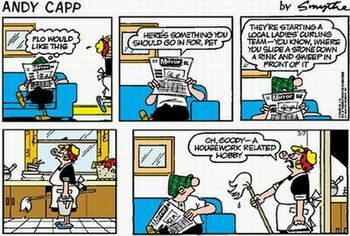 Andy Capp is not to be mistaken with the German curler Andy Kapp. In an episode of The Simpsons, Homer is seen reading Andy Capp in the newspaper. He roughly summarizes the comic when he laughs and says, "Oh, Andy Capp, you wife-beating drunk!" Homer once also lay down on the couch in Andy's characteristic style, and stated that Andy Capp had it right. He also makes an appearance in Family Guy when he is seen at the Drunken Clam with Peter before getting into a fight with Flo when she catches him drinking.